Does site design matter? 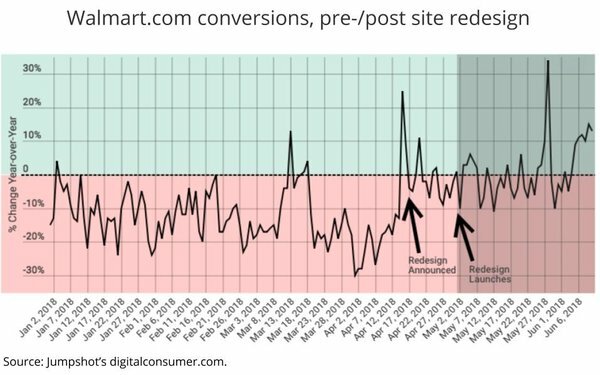 A Jumpshot analysis of actual user conversation data pre- and post- Walmart.com's site redesign in May suggests it absolutely does. "Since the relaunch just weeks ago, conversions have significantly increased, as have interactions, adds-to-cart, and order checkouts," Jumpshot notes on its digitalconsumer.com site, adding, "Just weeks before the website relaunch, conversions were 1.2-1.4% of overall visitors, but after the relaunch, they’ve jumped to 2-2.5% and holding steady." Mouse over the grid below to see Walmart.com's historical conversion levels.